What better way to ensure that you have fresh, organic eggs than to have your own hen house? Today’s site development plans are no longer limited to vegetable and herb gardens, berry cages and compost bins; they include ‘designs’ for a family run hen-house. Yesterday’s hobby of water gardening is today’s producing chicken garden. As a child growing up on a few acres, my father raised 45 chickens, several ducks and honey bees, seemingly to help sustain our family of 11. I’m sure, though, he enjoyed the challenge, variety and fun of this endeavor. He even grew mushrooms in our cellar! These practices have come full circle as families, again, try to sustain from within. It’s more than a personal interest; reducing reliance on mass produced eggs and chickens reduces the waste run-off into critical waterways, eliminates the energy and fuel consumption necessary to transport and refrigerate, and sends a message about the cruel conditions that mass produced chickens are raised under. Hen house ‘designs’ can be stylish and fun but keep in mind that this is not a weekend hobby. They must include security, shade, nesting areas, feeding areas, ventilation, protection from storms and weather, lighting, access and adjoining (or close-by) storage for ease of maintenance. You do need space. 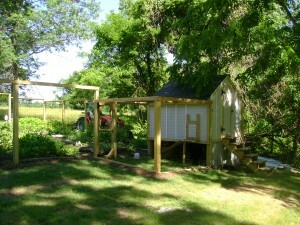 The average chicken will need 4 square feet of coop/house space and a minimum of 10 square feet of ‘run’. Free range chickens are, naturally, just that and require much more space. Make sure to check your local zoning laws before investing, as cities, counties and towns all have varying criteria.